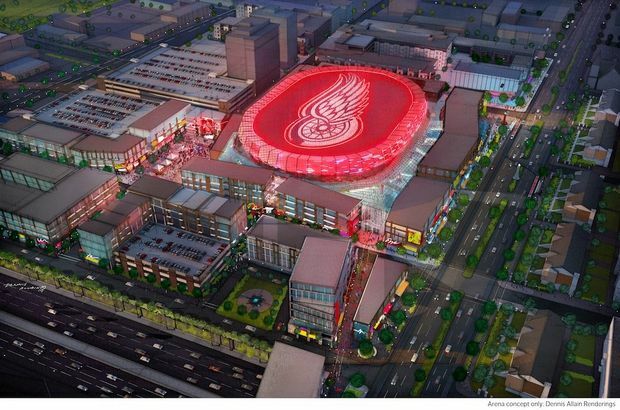 Rendering of the new Red Wings arena. When Detroit taxpayers forked over hundreds of millions of dollars to help the billionaire Ilitch family build a new Red Wings arena, the family made a lot of promise they failed to keep. Their contractors didn’t hire enough Detroiters; the family let more than a dozen large buildings languish instead of renovating them into apartments; and instead of creating revived pocket neighborhoods, they built parking lots and parking garages. Today we learned the family walked away from a verbal deal to pay $1.5 million to help a Cass Corridor homeless shelter move into a new and bigger space so that developers tied to the Ilitches could build pricey lofts, The Detroit News reports. For two years, the family’s Olympia Development had been negotiating with the nonprofit Neighborhood Service Organization to move the agency’s Tumaini Center on Third Avenue and Martin Luther King Jr. Boulevard. The agency provides numerous services to struggling people. Under a verbal agreement reached about a year ago, Olympia Development offered to buy the homeless shelter as part of a $1.5 million deal. The money would help the NSO buy a new facility on the east side. In early November, Olympia Development walked away from the deal. But according to NSO officials, the negotiations have restarted last week. The center is about five blocks from Little Caesars Arena. Developers linked to the Ilitches have purchased properties surrounding the center but have done nothing with them. Olympia Entertainment made a similar arrangement with a veterans homeless shelter, which moved to the west side several years ago. Just before the city declared bankruptcy, the Detroit City Council approved spending hundreds of millions of dollars to help the Ilitches build the arena – on condition that they renovate vacant buildings to revive the struggling areas near the facility. It never happened – and so far, Mayor Duggan has said nothing publicly. The money could have been spent on paying down the debt on the city’s old school district. Once that debt is paid off, the city could raise the millage rate to help Detroit’s struggling schools. But that won’t happen for a long time because it will take until the 2050s before the taxpayers’ debt is paid off.